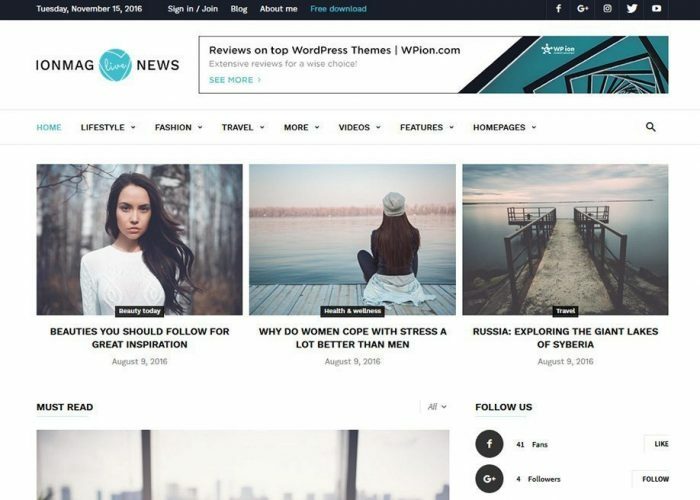 Get 30% off discount for ionMag Premium News WordPress Theme by WPion using the discount coupon code given below on checkout. ionMag is one of the premium WordPress theme developed by WPion. Read more about it below. If you are looking for a top quality theme for your site, I would recommend you to have a look at ionMag. This is a theme built for blogs, news or magazine-styled websites, but because of smart design, it can fit into any kind of website perfectly. We all know that for a news magazine site, the presentation of your content makes all the difference. 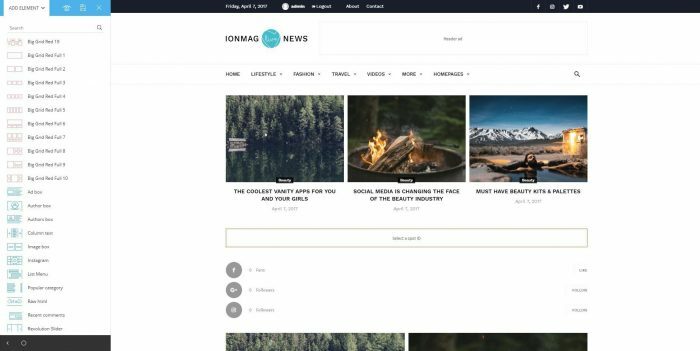 ionMag Theme will help you create engaging content. So, before we dig into finding more detail about the theme, let me tell that ionMag is responsive and retina ready. This template brings you an easy to use front end drag and drop page builder, custom widgets, multiple headers, footers and post styles. ionMag also supports videos from YouTube, Vimeo, and DailyMotion and features a rating system. Compatible and integrated with bbPress Forum, BuddyPress, and WooCommerce plugins, ionMag uses the best clean SEO practices. 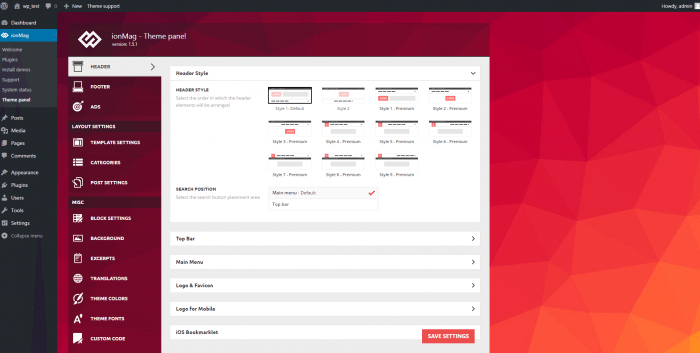 The theme comes with an interface called Theme Panel. I know most of the premium themes have one, but, trust me on this, if you haven’t used Newspaper or Newsmag theme by tagDiv before, then you have never met such an options panel. All the elements of your website are neatly organized in one place, and you can customize from header to footer, including the ads, from a single location. The author described it as “naturally easy to use.” After you play around with it, you’ll be expecting the same level of customizability from all the themes out there. Let say you love the theme preview and you want to replicate it on your website. Well, usually this means long customization hours and a lot of hassle. 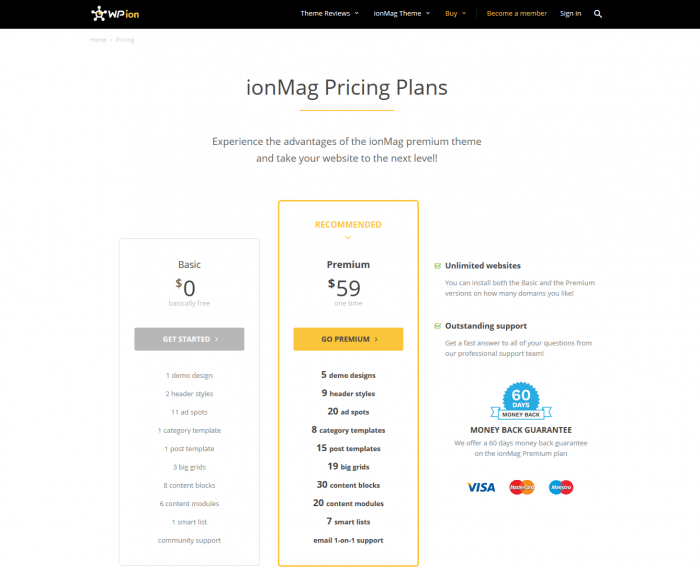 With ionMag, you get five out-of-the-box designs for your site. If you like one of them, you can import it. You can do this “with content,” I strongly recommend to try this only if your website is brand new, and you don’t have any content at all because the theme will bring you pre-built pages, posts, menus, sidebars and so on. The theme will populate the site with content. I’ve also tested it on a website that already had pages and articles, and I’ve imported a demo “without content.” To my surprise, the theme brought to my website only the design I saw before. From there, I’ve set up the main menus, the sidebar, and made some small customizations. In about 30 minutes, the site was an entirely new one. ionMag theme comes with templates for headers, footers, posts, smart lists. They are so diverse that I’m sure, you’ll find some of your taste too. Just pick the one you like from the theme panel and save the settings. If you are a WordPress beginner and don’t know how to code, well, ionMag is as easy as a template can get. The IonMag Premium theme is elegant, coded for fast loading websites. I must confess I wasn’t expecting anything else from the top author that developed Newspaper – the best selling news theme of all times on themeforest.net. My surprise was to discover the page builder that comes with ionMag. With tagDiv Composer, you can build beautiful pages and see the changes instantly. The author has created this plugin, especially for the ionMag theme. It works based on a row and column architecture. If you want to build a new page, you can create it from your WordPress admin dashboard and then customize it with tagDiv Composer. This will take you straight on the frontend. The page builder gives you access to a list with dozens of elements: blocks, modules, widgets, empty rows, separators and so on. Just drag the block from the list and drop it in the live preview window, the arrange the desired elements. Save your settings, and you’re set. You must try it to understand my excitement! ionMag comes with an Adsense ready ad system. It includes 19 predefined ad spots placed in the most productive areas of your website. Every ad location on your site comes with a box where the ad code can be placed. The theme will automatically search for the banner via Google AdSense and will make your ad responsive. If you want to use a banner or non-AdSense ads, just paste your ad code in the box. Clean code, optimized and tested for high-performance. Five pre-built demos that you can install with just one click. Comprehensive documentation and a dedicated user support center. Compatible with popular plugins like WordPress SEO by Yoast, WooCommerce, bbPress, BuddyPress, WP Super Cache, Contact form 7, Font Awesome 4 Menus, Jetpack. More than 15 beautiful post styles to display your content. Over 32 Big Grids blocks to help you feature the most relevant information on your website. Over 25 modules to display your posts on pages. Eight smart lists – The theme auto-generates the smart lists for you. All the category templates are fully customizable. 11 Header styles and 4 top bar templates for you to choose from. Lazy load effect – To add more style to your website, we have designed from scratch the best lazy loading effect to work fast with our theme. Intelligent Ad System – 19 ads spots where you can insert your ad code and quickly monetize your website. Custom made lightbox effect designed to create an impressive user experience for site visitors using full-size, high-quality images. Custom-built drag and drop gallery. A sticky menu that hides on mobile devices when you scroll down, and it shows up when you scroll up. Stylish Fonts: ionMag theme comes with support for Typekit, Google Fonts, font stack and WOFF font files. ionMag is a must have theme but comes with some downsides you must know about. First, it may take you a few hours to learn your way around this template. But once you do, you’ll enjoy customizing everything. Second, ionMag lacks the video tutorials, although it comes with an extensive documentation with screens and recommendations. Let’s wrap things up and say that for blogs and news magazines, ionMag Premium News theme is an excellent solution.